After covering all the places in the footsteps of Lord Rama, our final destination was Srirangam. This was concluded at Sri Ranganathar Swamy Temple, Srirangam with great bhajans and poojas. The 34th episode of Sri Ramanin Padhayil was the coverage of bhajans, Patta Abhisheka, Upanyasam (Discourse) and Mangalam (may also mean “good wishes”, or “wishes for a happy ending) held at Srirangam. Meaning: The river Kaveri is the very same Viraja River flowing in Vaikuntham and the temple in SriRangam is Vaikuntham itself, the abode of Vishnu. 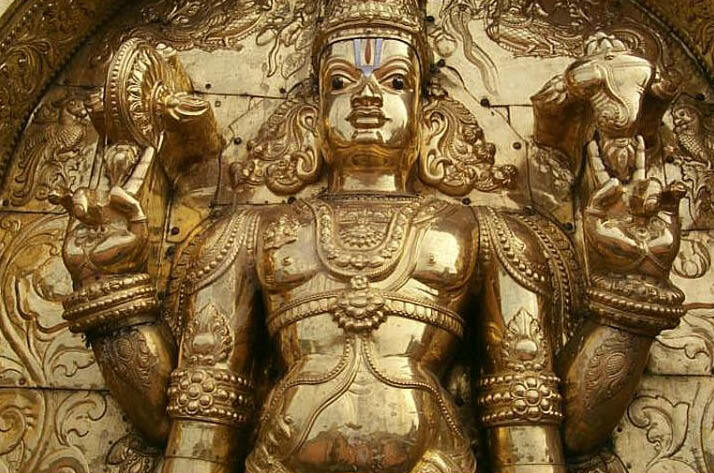 The lord of SriRangam is none other than Vasudeva Himself. The Vimanam is in the form of Pranava—the life-sustaining mantra. The towers are like the vedas and the Lord Rangasayi is enunciating the import of the Pranavam. SriRangam is considered as Booloka Vaikuntam because it gives the experience of Vaikuntam in the Boolokam itself. 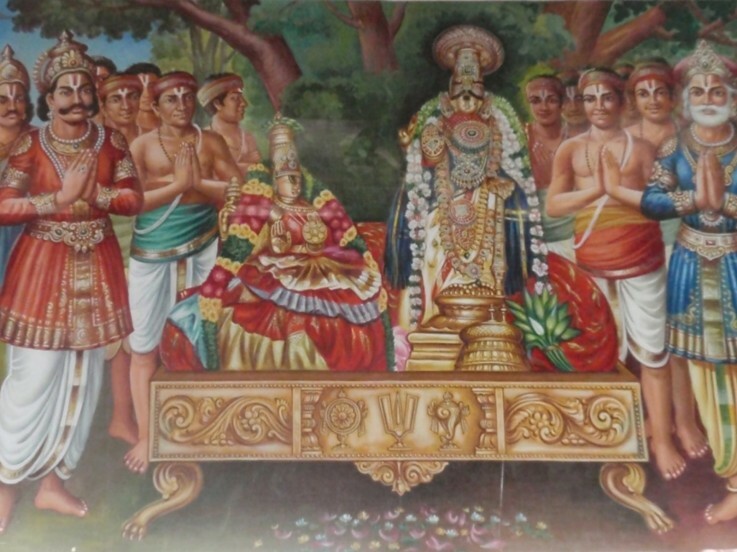 As Thondaradipodi Azhwar conveyed in his Thirumaalai Prabandam, SriRangam is Sriman Narayana's thrithiya vibuthi, the other two being Leela Vibuthi (Bhu, Bhuva, Svaha) and Nithya Vibuthi (Vaikuntam). SriRangam is like the root for the Divya Desam tree. If you are not able to go to all the divya desams, atleast go to SriRangam once as that is equivalent to visiting all the Divya Desams. Hence if we sing the praise of SriRangam, it is equivalent to singing the praise of all the Divya Desams. That is the reason we sing only about SriRangam daily in the following sloka. Hence SriRangam is the foremost of all the divya desams. SriRangam is the only divya desam that received maximum songs from all the azhwars. SriRangam is where all the azhwars and acharyas served the Lord. In Naachiyar Thirumozhi, Andal says that SriRangam is where all the Gods from all the 108 divya desams come to sleep at night. SriRangam is the thalaimai peetam (headquarters) for SriVaishnavism. Everything in SriRangam is big and great (Periya). Perumal is Periya Perumal, Piraatti is Periya Piraattiyaar. Gopuram is Periya Gopuram (Tallest in Asia). 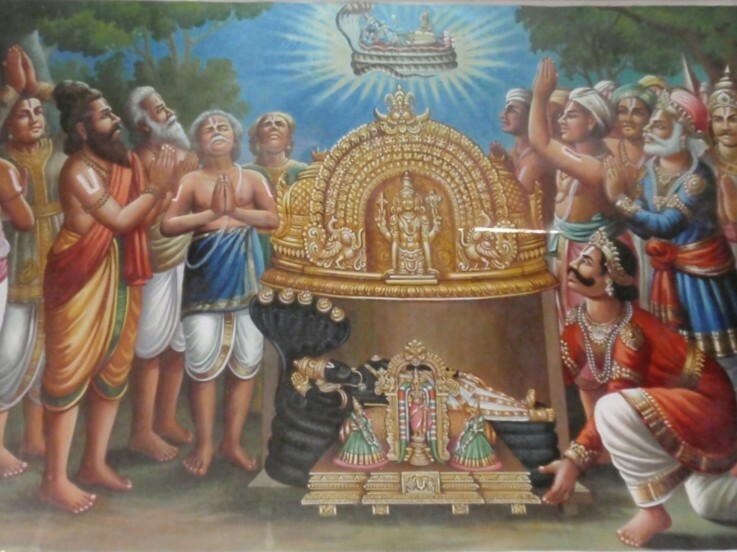 Adhyayana Utsavam is Periya Utsavam. This shows his Perumai (Greatness). At the same time his Elimai (simplicity) is seen when Lord Ranganatha calls SriRangam as Nam Ooru (My place) in Thirunedunthandakam prabhandham by ThiruMangai Azhwar and Perumal is called NamPerumal, becuase HE is for us. It is commonly noted that Periya Perumal is only Lord Krishna. It is said that you can see the rope marks made when Yashoda tied Krishna with the rope, on Periya Perumal's waist. Ofcourse we cannot see it as the Vasthram covers the waist but Periyazhwar has said, so we have to believe it. 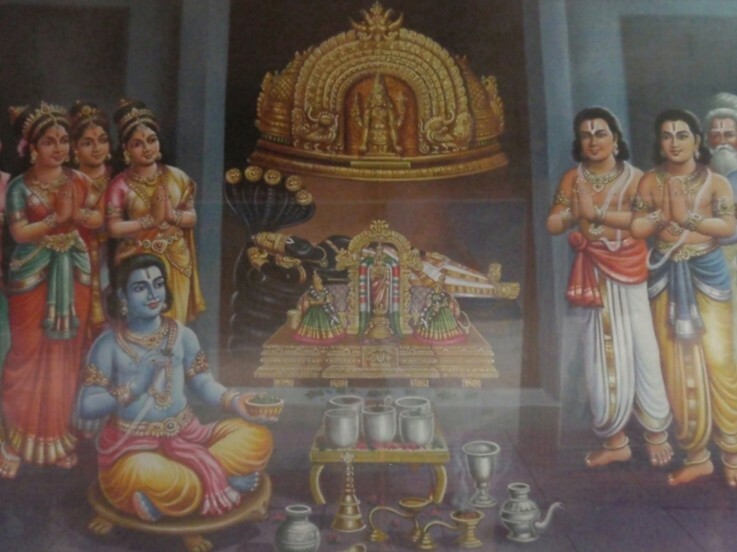 When Srimad Ramanuja did Saranaagathi to Piraati and Perumal on Panguni Uthiram day, he asked the Lord to grant Moksham to all related to him and the Lord agreed. Immediately Ramanuja asked how he can believe HIM as HE never kept HIS word when HE was Krishna, but immediately NamPerumal said I am Rama and I always keep my word. So NamPerumal is believed to be Rama and that is why we should also be a shishya to Ramanuja so that we can get moksham as promised by the Lord. The origin of the SriRanga Vimanam is said to have been narrated by Rudra to Narada. 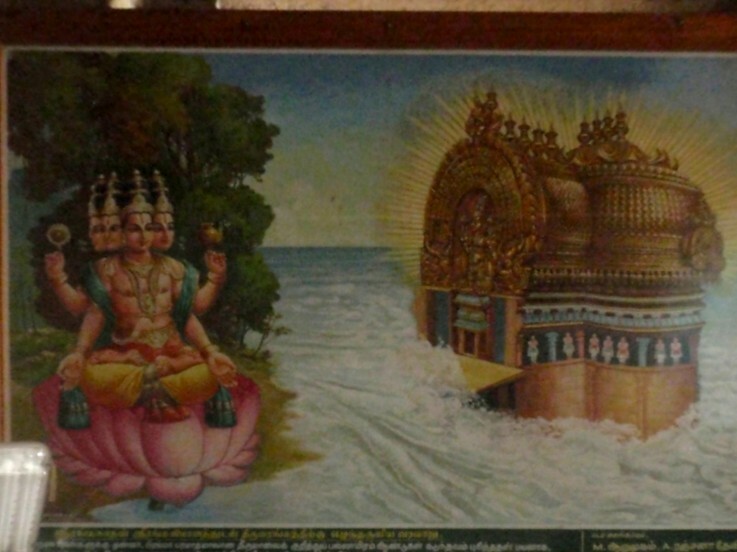 According to the SriRanga Mahathmyam, as a result of Brahma's tapas, the glittering SriRanga Vimanam sprang from the depths of the Milky ocean (Paarkadal) radiating luster allround. 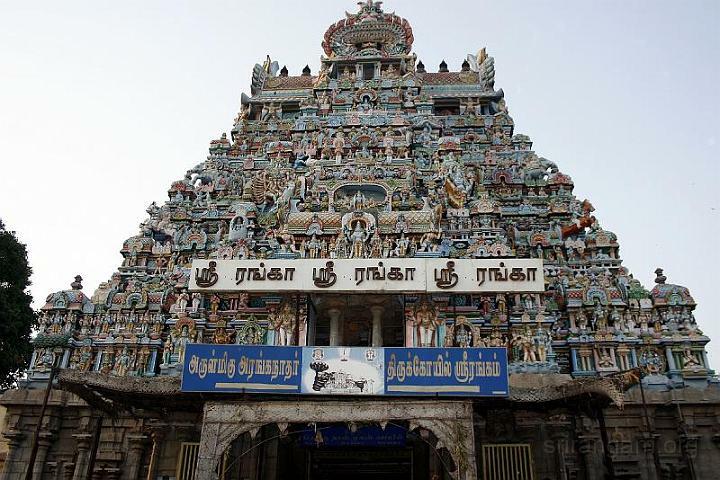 (The expression Sriranga Vimanam is used to denote the turret as well as the oval shaped sanctum beneath it, containing the image of the reclining Ranganatha. The turret, the sanctum and the image form a single whole and are inseparably associated with one another.) It was borne by Garuda. Sesa, the Serpent God, had spread his hood over it. Visvaksena, with a stick in hand, cleared the way for the God. The sun and moon were fanning the deity with chowries. Narada and Tumburu followed singing. There was the Jayaghosa of Rudra and other gods and the ‘Dundubighosa’. The celestial courtesans danced. Clouds rained flowers. There were great hurrahs and tumult. 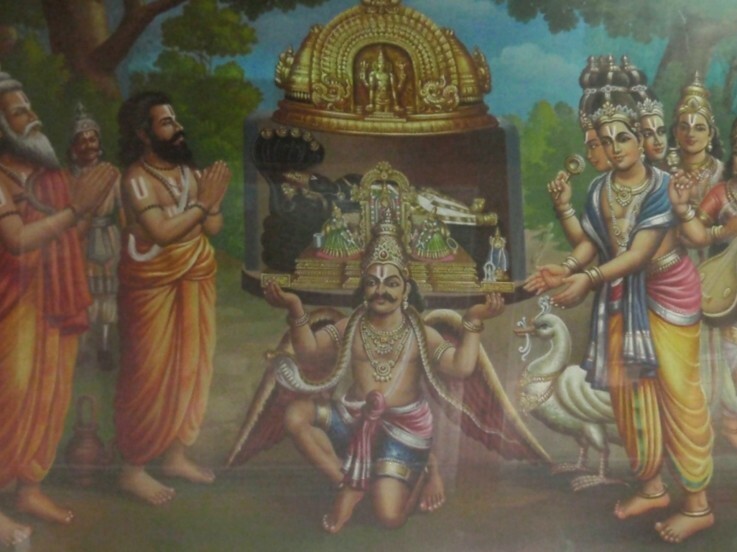 Brahma awoke from his penance and prostrated himself before the vimana. He stood up saying the four Vedas through his four mouths and was lost in amazement. Sunanda, a celestial watch at the gate (dwarapalaka), told him that the three lettered Vimana, ‘Sri-ra-nga’ was the result of his penance, that God was resting with His consort inside and that he could see Him and worship Him. Then Brahma worshiped the Almighty for a long time. (4) Manusya - created by mortals. 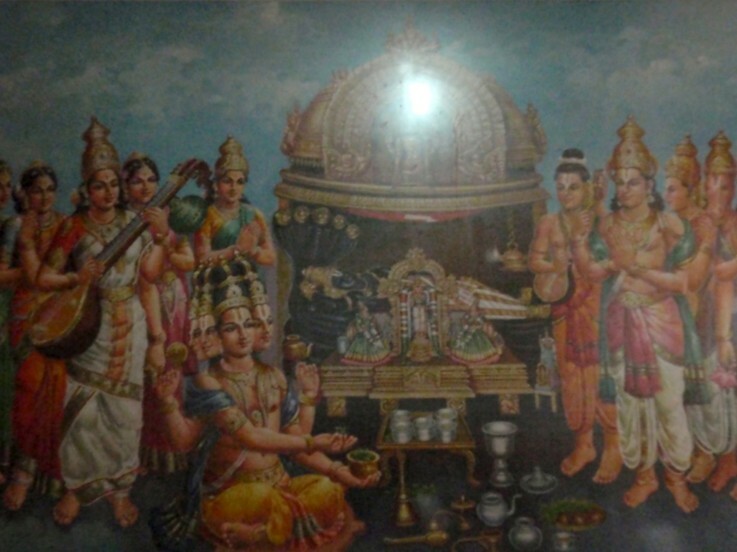 “The Vimanas of the first class, viz., Svayamvyakta will appear in eight places - Srirangam, Srimusnam, Venkatadri, Saligram, Naimisaranyam, Totadri, Puskara and Badrikasrama. Rangavimana is the first and the earliest of these”. Then the God explained to Brahma the procedure for conducting the worship and lay down in yoganidra. Brahma took the vimanam from Paarkadal to his abode in Satyaloka and established it on the banks of the Viraja river. He appointed Viwasvan, the sun god, to do the daily puja of the God. After Viwasvan, his son Vaivasvata Manu continued the puja. Iksvaku, a son of Manu, became the king of Ayodhya and found it difficult to worship the vimana at Satyaloka. Hence he did penance, which extended over hundreds of years, and obtained the permission of Brahma to take it to Ayodhya. Thus, the Vimanam came to Ayodhya. After Iksvaku, his descendants worshiped the God. Rama, himself an avatar of the Lord worshipped him. 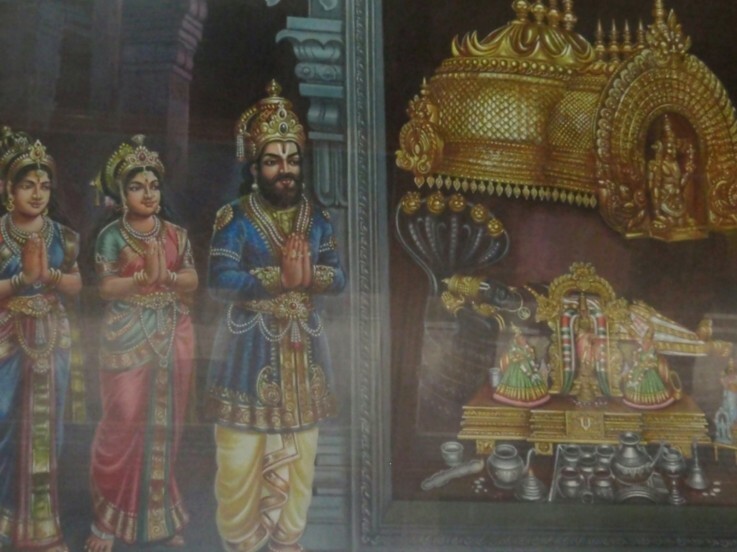 Because Rama (Perumal) worshipped Perumal, Lord Ranganatha is known as "Periya Perumal". In the meantime, Dharmavarma, a chola king who had seen the Ranga Vimanam, knew its history and wanted to have it in his country. So, when he returned home he began performing penance on the banks of the Candrapuskarani. But the rishis told him that his penance was unnecessary as the Lord had told Brahma when he gave the Ranga Vimanam to Ikshvaku that He will go to Srirangam and stay there till the end of the Kali Yuga and then return back to Satya Loka. On hearing this Dharmavarma stopped his penance and retired to Nisula. 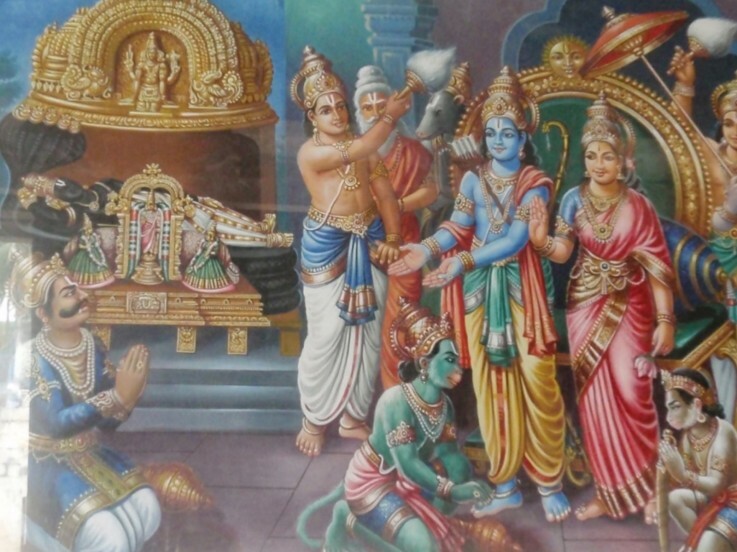 On Lord Rama's triumphant return from Sri Lanka, in the coronation held in grand style, Rama gave the Vimana as gift to Sri Vibheeshana for worship. Vibhishana bore the vimanam on his head and, on his way to Lanka, stopped at Srirangam and placed the vimanam on the banks of the Candrapuskarani. The rishis immediately informed Dharmavarma about the arrival of the vimanam. The Chola king came to the spot and received Vibhishana with great delight. The latter bathed in the sacred waters of the Kaveri and worshipped the vimanam. 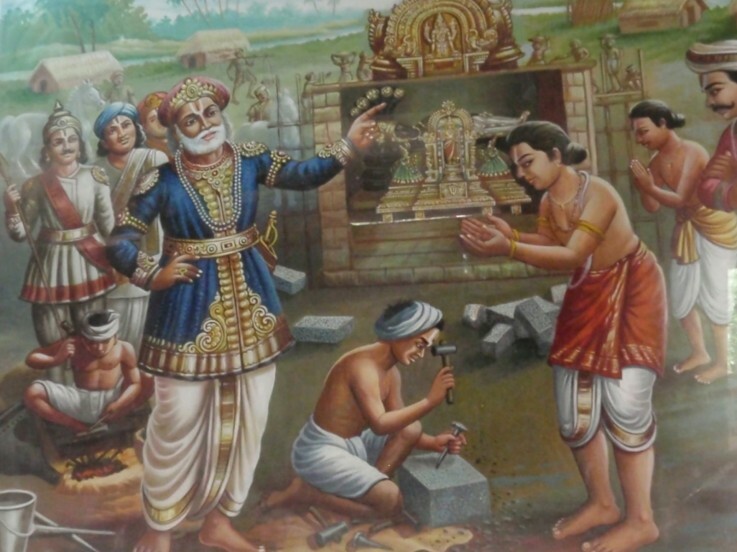 Dharmavarma also performed puja and requested Vibhishana to stay with him for a few days. 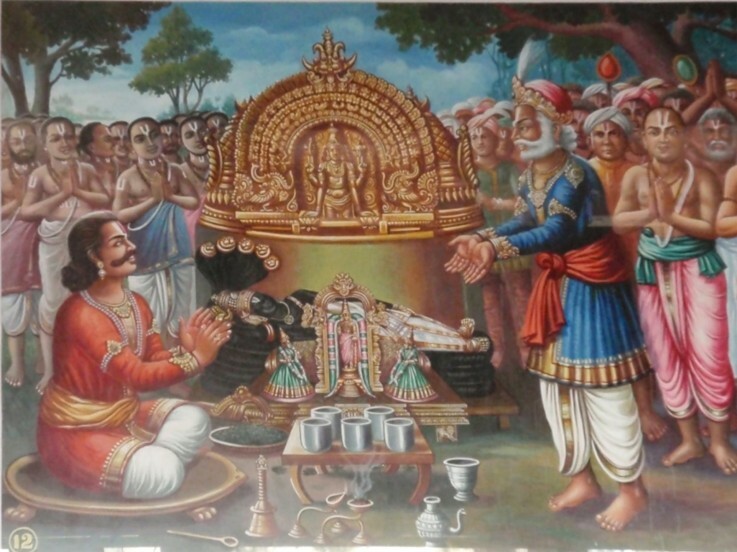 To this Vibhishana did not agree and said that an utsavam had to be performed in Lanka the next day. The chola king requested Vibhishana that the festival might as well be performed in his own country. Vibhishana then agreed to stay, and the festival was begun and celebrated for nine days in a grand fashion. This is the Aadhi Brhamotsavam that is performed in Panguni month. After a stay of a fortnight Vibhishana started for Lanka. To his utter amazement and sorrow the vimana had got itself fixed to the spot where he had placed it and had become irremovable. Vibhishana shed tears. The God then said to him, “This place is good, so also its king and people. I desire to stay here. You may retire to Lanka”. He also related to Vibhishana the sanctity of the river Kaveri. “Visvavasu, a Gandharva of the Vindhyas, met on the hill side a congregation of river goddesses and made his obeisance to them. Immediately a debate arose as to whom it was meant. All except Ganga and Kaveri withdrew from the contest. Both the disputants went to Brahma, who declared that Ganga was superior. Kaveri did penance as a result of which Brahma granted to her a status of equality. Still dissatisfied she is performing penance at Saraksetra. To give her the first place among the rivers I have to raise her sanctity to the utmost by remaining in her midst. I will recline here facing your country.” Hence the SriRanga vimanam stayed in SriRangam with the lord facing south towards Lanka. And Vibhishana is said to come to SriRangam to offer his puja everyday at midnight. 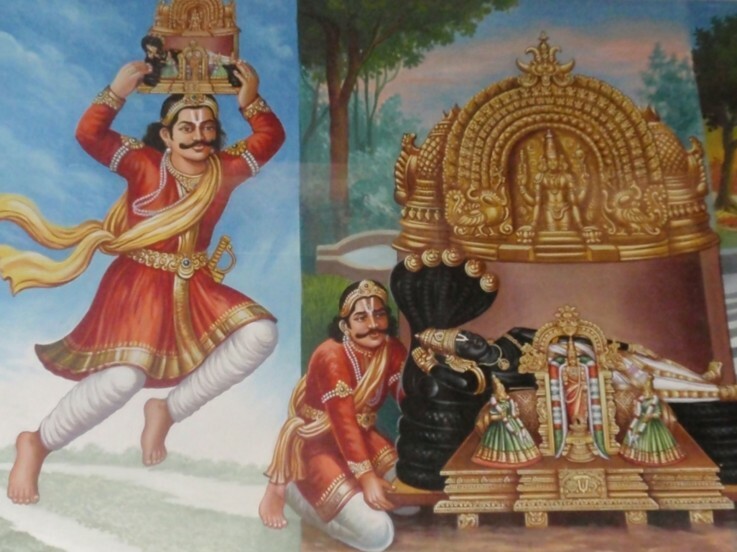 King Dharmavarma then built a shrine for the vimanam, the surrounding prakaras and organised worship. In course of time, Nature devoured the site. The Sri Ranga Vimana and the structures disappeared and became a habitat for wild animals. A ruling prince of the Chola dynasty hunting to that spot overheard a parrot repeating a sloka. The river Kaveri is the very same river Viraja that eternally flows in Vaikunta, Srirangam Temple is verily Vaikuntam itself, the Abode of Lord Vishnu where he sits in all splendour and majesty in the company of Nityasuris. The Lord of Arangam, is none but Vasudeva, the Primeval Lord Himself. The Vimana is verily the external Paramapada itself. The Vimana is in the form of the Pranava (the life sustaining mantra). The four towers are marvelously akin to the four Vedas and the Lord, Sri Rangasayee is expounding the import of the Pranava. On understanding the import of this sloka, the chola caused the earth towards the west of the tree (known as Tirumudikkurai) to be dug deep to lay a secure foundation for the Sriranga Vimana. But the Lord appeared before him in a dream and pointed out to him the exact spot wherein he lay. The king was overjoyed at finding the glittering Ranga Vimanam there. He cleared the forest, constructed all the essential parts of the temple, laid down flower gardens, instituted temple services and forms of worship. The shrine became widely knows as "Tiruvaranga Tirupathi", thanks to the benefactions of Kili Chola and his successors who ruled from Uraiyur. With this, not let us conclude the journey in the footsteps of Lord Rama. Meaning: I again and again salute that Rama who is ever beautiful, Who destroys all dangers and gives all sorts of wealth. sudar azhiyum Pallandu*Padai por pukku muzhangum ap panchasanniyamum Pallande. Meaning: I bow down to him whom I know as Rama, RamaBhadran, Ramachandran, Raghunaathan, Naatha(my overlord) and husband of seetha. From Srirangam all the devotees left to there respective homes with the divine memories of Lord Rama.